We base our designs on a program we develop with our clients’ needs, wants and dreams. Working from general to specific we explore the projects environment, occupants living and working patterns, space relationships, esthetic character, and finally, product cost based on quality, quantity, life cycle and sustainability. We work through the preliminary design with hand sketches, which are then developed into a virtual building model (or Building Information Model, BIM). This computer-animated building model requires many decisions up front which are easily changed but are nonetheless made early on. Conceptual design is best kept “free hand” until everyone is comfortable moving forward. The virtual building model is truly amazing due to the understanding it offers not only to the client but to the designer and anyone else who has interest or input. Countless three-dimensional views are studied from overall to the smallest detail. Changes are easy if they are not conceptual. The virtual model is very smart with data. This data can be reported to the project team through schedules and specifications. Project data is then used for cost estimating and bidding. If costs are not right then the virtual model can be changed with design revisions that change quantity, quality, life cycle and sustainability. Alternate building systems can also be explored such as structure, heating/ventilating, exterior envelope, interiors, lighting and electrical. Ultimately, this decision loop in design is ready for construction. Final estimating, negotiations and bidding can take place based on an amazing published set of very detailed, exact construction documents. Unlike two-dimensional drawings of the old days this virtual model construction set of drawings has integrated three-dimensional views of not only the overall aspects but all the way to the smallest detail and drawing conflicts are almost nonexistent. Builders will develop confidence in the design documents, which results in better work and lower costs. Once builders give our team their estimates/bids, a construction budget and schedule is established and construction contracts are signed. This construction contract project phase is an important time where expectations are being set. Clear and precise drawing documents, schedule, cost budgets and contracts are critical to make the project successful. During this phase, permits, financing, construction and project insurance are obtained and listed in the budget and contract. Consequences of project non-delivery are outlined and agreed upon. Schedule of payments, deposits, overhead and profit, taxes and retainers are agreed upon as well. Once contracts are signed, expectations are set for the project team and everyone has to deliver. Once construction commences, the virtual model is updated as issues are resolved in the field or changed by the project team. Conceptual ideas can be explored (free-hand again) and then tested on the virtual model. Generally, the construction phase changes happen which can result in delays and usually extra cost. The construction documents are republished and sent out via email or online to the builders and suppliers. Resulting changes in cost, schedules are accounted for monthly. A “Release of liens” by builders is obtained monthly for progress payments. 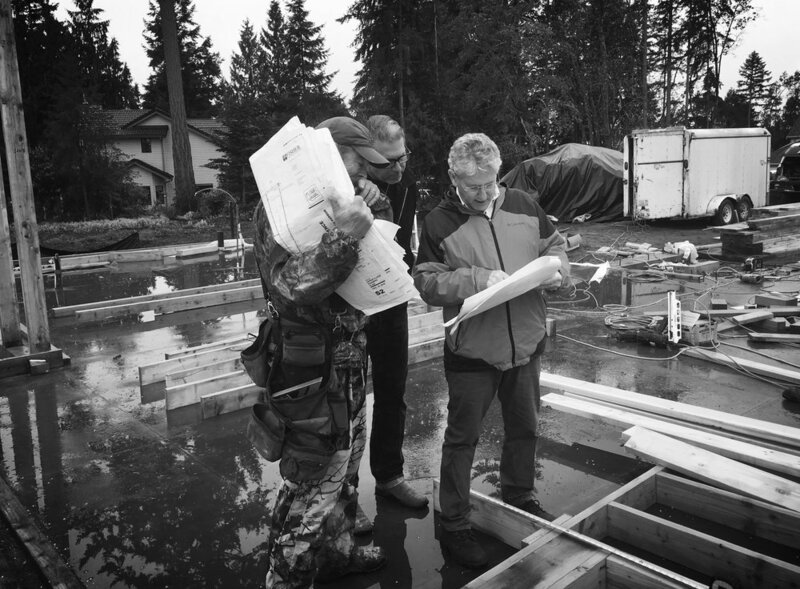 Our project manager or architect, client, and builders hold weekly site meetings. Our on-site superintendent controls schedule quality and picks up minor construction work as required. Specific project submittals are reviewed and approved by the project team. Project submittals can include building system designs by the design builder. Many final decisions are made during construction and all are recorded or updated in the virtual model to prevent conflicts. Submittals, such as shop drawings, are studied to comply with the virtual model. Once the building is complete the virtual model is republished with either paper copies or electronic data or if the building owner/operator request a working virtual model. The owner/operator may continue to use the virtual model for many reasons, including light or sound acoustic studies, furniture layouts, interior decorating and future additions/ remodels. Over the last 25 years we have developed a holistic approach for our projects. From initial idea through design and construction we administer projects to their completion. Our communication of concepts and ideas are timely, accurate, complete, and beautifully illustrated with hand-drawn and computer-animated views. Our design process requires decisions from clients early so that we can control cost to give the best value. We apply and integrate sustainable building systems and products to reduce operation cost and carbon footprint while maximizing an interior environment that is a balance of comfortable, cost-effective, and luxurious. Ideas, concepts and dreams (ICD’s) come from differing sources and are thought of on several occasions during the project. Like most creative processes, our firm’s design team and visionaries of a project cannot control or force these inspirational ideas. They are the heart and soul of a project. They are the basis for a projects success if chosen wisely or failure if chosen poorly. Ideas, concepts and dreams come in variety of classifications and are prioritized based on the wants and needs of the project team. The major classifications are; economic, physical or environmental, spatial, metaphysical, geometric, contextual, historical, health and sustainability. Many times economic factors are the pervading priority, however if all the other ideas, concepts and dreams are ignored the project can fail. Projects need a rich mixture of prioritized ideas or concepts to be successful. The project’s success is based on many other factors other than economic, but if the economics base does not work the project can be in trouble. Many projects never get off the ground due to economic or financial reasons. The project architect (PA) is responsible for managing these ideas, concepts, and dreams. The PA not only may have ICD’s of his own but organizes, prioritizes and illustrates. Again the ICD’s can be realized and implemented at any time during the project’s process. Design processes are rarely linear, the process usually goes in loops that start with big overall picture and work to small details. But these loops do follow a linear path. For example we may start with a big picture of budget, site constraints (such as view and space dimensions) and have a metaphysical design concept. Then towards the end of the design process, the PA may refer back to the metaphysical concept and reinforce or enhance it with lighting that is within budget constraints. Balanced and appropriate ideas, concepts, and dreams are the basis of great projects. Presently, buildings use 40% of the energy that we use each day for heat, cooling, lighting, electronics, appliances and many other devices. Building and the surrounding site displace the rainwater in wasteful and damaging ways that erode and flood our land. Rain water that falls and drains through driveways and parking lots picks up vehicle hydrocarbons and chemicals which then dump into our streams, rivers and lakes damaging our ecosystems and killing aquatic creatures. In response, to save energy, over the last thirty years, we created and tightened energy codes to add more insulation, tightened building envelopes, and created more efficient HVAC equipment. We also required our project sites to manage or store rainwater and in some cases filter the storm water prior to discharging downstream. However, we have created additional problems. We have run into health problems by sealing our buildings and not providing appropriate ventilation and installing building materials with Volatile Organic Compounds, which can cause serious health problems. Moisture build up inside buildings have caused mold and mildew that not only rot the building materials but damage health as well. Project sites now store or manage storm runoff but they do not replenish the aquifers we are depleting. In the future we will create healthy building environments and push to be ‘net zero’ in energy use. Our buildings need to be healthy first while integrating energy efficient features and systems. Materials used in the interior need to be free of volatile organic compounds (VOCs) and chemicals that can hurt us. Presently many carpets, fiber boards, glues have formaldehyde and other VOC’s. Natural materials (reused or new), careful responsible manufacturing can easily reduce or eliminate VOC’s and chemicals that pollute our interiors. Energy recovery ventilators or heat recovery ventilators should be used to not only reduce our energy use but also rid us of stale polluted air and continuously provide us with preheated fresh air. Our energy sources should be healthy to our planet and we can provide energy to our projects and the local electrical grid with solar panels, wind turbines or other natural sources. Government and utility programs allow us to feed extra electricity we produce back into the gird resulting in near or net zero energy use. Rainwater needs to be stored and reused on site and possibly in our buildings toilets, washing, landscaping, or other safe sanitary methods. The rest of the water can be used and stored in water features that enhance our connection to nature and ultimately returned clean to the aquifers, streams or simply evaporated. The building industry has many organizations like the U.S Building Council LEED program. Built Green by the Master Builders Association that have quantifiable point systems that rate a projects level of compliance, while the LEED system is required for many public buildings and for private buildings that house government workers. LEED is the most intense compliance system, however getting certified does not mean you are close to ‘net zero’. However, it is the right direction and many requirements are finding their way into codes by all building jurisdictions. Sustainability is the ultimate idea that we all need to understand and strive for. We all have to take responsibility to our planet, country, community, neighbors, and ourselves.